unlock a Women's potential in a millennial world. I grew up believing that Beauty was a physical feature you were born with. Than I became a young adult and was convinced Beauty was in the soul of a grateful human being. However this changed when I met someone who shared a profound insight that I reveal in my ebook. I pondered for twenty years [yes 20 years] thinking about this question, "How do I walk in beauty?" In the mean time I traveled the world teaching Polynesian performing arts, working in cultural and holistic careers but never forgetting those words, "Walk In Beauty." In all honesty I was compelled and inspired to write my observations into a book from 1995 to 2001 but I couldn't. Eventually I got married and had a few kamali'i - little ones in Hawaiian language. By a few I mean seven [yes 7 children] who were about a year to two years apart. Motherhood and my career as a holistic fitness instructor kept me busy but when my oldest daughter was about to turn thirteen I remembered a previous endeavor. To write, edit and publish, "Walk In Beauty." After all, thirteen is a huge step away from childhood and my baby/big girl would need this book. So in 2016, during a year of extreme hardships [I'm saving that for another day] I decided to buckle down and write. The goal was to create a manual that would unravel Beauty's Secrets while combining creativity and self expression [aka: journaling]. I published it on March 15, 2017 on my youngest son's fourth birthday. Through much prayer and a bunch of edits the 5-Realms of Beauty existed in the form of a mobile friendly ebook. Start a WIB "Sip & Socialize"
After publishing the book I started to define characteristics that seem flow among each and every realm. I picked out eight that really stood out to me. 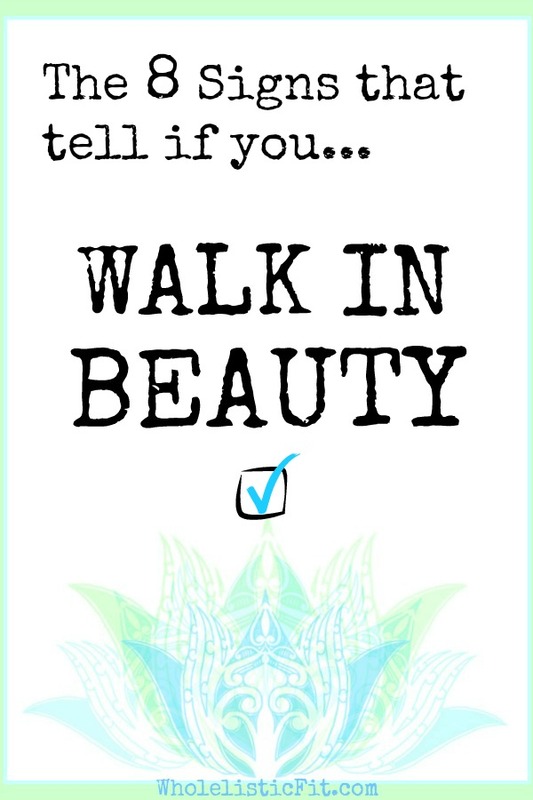 It was kind of a checklist for "Walk In Beauty" or what I call the WIB-Checklist. Which of these 8 characteristics do you identify with? Self-Love: the ability to care for and nurture yourself. Infectious Joy: happiness comes from within you, you manufacture joy. Peaceful Mindset: because your foundation is built on self-love you can weather life. Patient: time is a teacher and the journey is more important than the destination. Kind Nature: because kindness is the most attractive commodity in any culture. Consistent: diligence and perseverance are key factors in everything you do. Self-Mastery: the number one attribute and this is why you walk in beauty. Harmony: maintaining a sense of community in every arena of your life. I'll leave you with a little bit of my daily holistic practice of art-journaling. PEACE Be the Journey. This sight is for educational purposes it doesn't provide physical or psychological help, consult a doctor. All images and content are property of ©Hoomalamalama and MANAIA Design & Production™. Unless otherwise posted such as XYNGULAR® products which are clearly identified as "Independent Distributor" to educate the consumer.